Land is a finite resource, the Guardian journalist Peter Hetherington reminded us, in his opening address to a one day seminar organised by Shared Assets in London recently, on the theme of ‘Common Good Land Use’. He added that Mark Twain had expressed the same view more pithily: ‘They don’t make it any more’. Not quite true of course, when you consider the history of The Netherlands (or parts of East Anglia), but then again, that is always reversible. 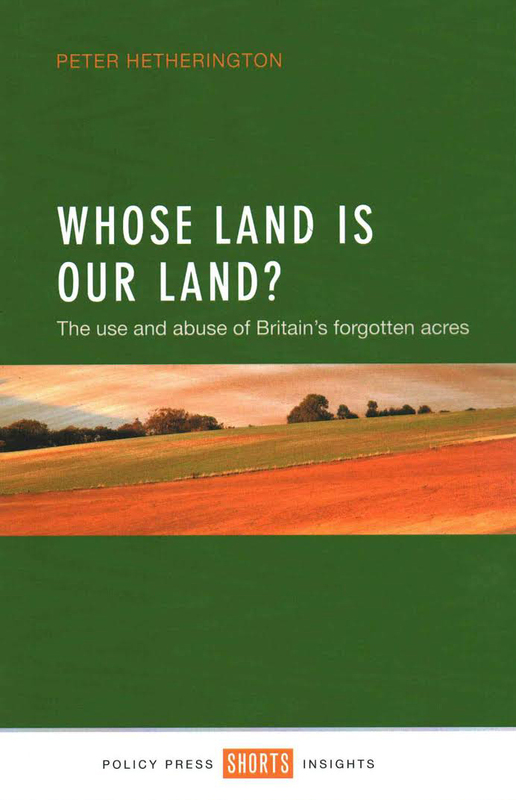 Hetherington’s punchy little book, Whose Land is Our Land?, on which his talk was based, points out that today in the UK, ‘57% of our best agricultural land is at or below sea level’. Climate change now threatens this; something more to worry about in a post-Brexit era, with its plucked from the air promises of increased agricultural self-sufficiency. It was social rather than environmental concerns that were the focus of the day, however, as contributors referred time and again to the devastating effects uncontrolled land prices were having on re-configuring the social make-up of villages, towns and cities across the UK. House prices have been soaring, social housing continues to be sold off, and ‘buy to let’ schemes have brought high rents and increasing tenant turnover. All of this leads to more fragmented and less stable communities. In some parts of Britain today, according to Hetherington, the cost of the land constitutes two-thirds the price of a new home. Land ownership in the UK is amongst the most concentrated in the world, with almost 70% of the landowner by 0.6% of the population. One issue not mentioned during the day was the disturbing new trend by which the volume house-builders now sell an increasing proportion of new homes on a leasehold arrangement, rather than the traditional practice of selling single houses freehold. This means that the developer retains ownership of the land and can continue to charge ground rent indefinitely. Nice work if you can get it. High land prices mean that new social facilities such as parks, schools, libraries, health centres, churches, and especially public housing (rare as these are becoming), only get built if they form part of a development package that includes large swathes of private flats or offices. Public life and culture is being squeezed out of the street scene, as every available plot of land is handed over to the private sector for development. This is the story behind artist Jessie Brennan’s exemplary project at The Green Backyard – a former derelict site in Peterborough’s city centre, transformed by volunteers into a vibrant community garden which I visited earlier in the year. Brennan’s book on the process, Re: development, shares the voices of those defending their right to the city. Published in October 2016, it includes not just documentation of the site and its transformation, but a number of essays – architectural, philosophical, political – by an impressive roster of writers including Anna Minton, Ben Rogaly and Jane Rendell, on the threats now posed by the unregulated market in land ownership to civil society and the public common good. Brennan’s work is a good example of the role artists now play in imaginatively alerting us to the most pressing issues in urban and environmental politics. At the Shared Assets event there was much talk of Community Land Trusts (CLTs) being the way forward. There are now over 170 CLTs in England alone, and two of the larger London projects are based on places whose future development has been a matter of concern for some time: the former St Clement’s Hospital in Mile End, and at St Ann’s Hospital in Tottenham. They are big sites with ambitious plans for social housing, workspaces and other amenities. The rising land values that accrue from development will be captured by the Community Land Trusts that own and manage them to pay for communal benefits, in the spirit of Ebenezer Howard’s path-breaking model at the first garden city at Letchworth. Despite the excessive use of the possessive case by politicians, with endless evocations of ‘our country’ or ‘this land of ours’, such sentimental rhetoric has no basis in the hard facts of actual ownership (much of it unregistered and therefore secret). Peter Hetherington boldly claimed that despite this, ‘Britain is ours morally, if not legally.’ The land question is back on the political agenda again.